There are over 100 images in this Primer. Gen room take down maps, base securing paths, armor and air formations to support squadrons. I recognized long ago the vast wealth that sits inside the Planetside forums in these MASSIVE SCROLLABLE posts that made me dizzy to read. I remember being shown some base attack maps that Strikefear from BA made up back in the day. I cannot tell you a damn thing the text said from those days, but the maps… .I remember the way the maps looked. It is VITAL to include as many images as possible (despite this page, doh) in whatever you are trying to convey so as not to make your audience zone out like you’re doing right now. All the pages in the Primer are linked by topic on the left hand side of the screen. On the right are subsections that each major topic breaks into. These menu’s occur on each and every page for easy reference. This primer is the most wordy of any of the past five, which I actually dislike (though it does look like I love to watch myself type) but we just needed to tie down so many loose ends that came up in the field and were too vague with just an image or a map to explain. There are aircraft tactics in this primer. This is not an air corps manual. There are armor support tactics. This is not an armor squadron document. This Primer is for SQUADS only, all the other information included is for the equipment to be used to advance squads to their final destination (usually the enemy CC). Someone else will quite rightly come up with a proper Armor Primer (WNxArgg most notably) and air (Kenwayy?) But this is how you keep a team of 10 together, on the ground, in close proximity, and make it work. Is this for real? Does Warrior Nation REALLY attempt all this? This is how Warrior Nation will function in the field. Especially the Elite (Sentinel) unit. The regular outfit adopts nearly all these methods of play, but are not rigorously enforced the way they are in the elite team. If you are a new recruit, you will be sure to see most of the tactics in here employed, even in a casual afternoon half sanctuary squad. When the Sentinels play the Primer will be followed in an over the top style that not many can stand. Not everything in here will come off without a hitch. Platoon Leaders have an enormous weight placed on their shoulders now with the advanced battle plans they now need to lay out. It is hopeful that because of these plans, you, the individual soldier will have a greater situational awareness and are less likely to NEED to ask what’s next. For my own elite team from WNx, read it till your eyes bleed. For new recruits to Warrior Nation, congratulations and here is your first reading assignment. For the Clan of WNx take pride that WN is respected in Planetside. And for other game leaders in the ‘Nation’, you could gleam some information from here that you could take into your game of choice. For SOE, this is the game I think you wanted to make. This is what people imagine when they look at the box. 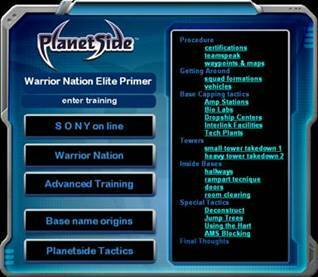 The original Primer (seen right) was written solely for the use of the WNx Elite team but since then has been enlarged and put out for the masses of people that enjoy this tactical style of gaming. The many appendixes added to this Primer contain all the useful maps anyone playing any style could ever want to help break their way into CC’s of ANY base. Advanced treasure maps pointing the quickest routes to the Gen rooms for mad bombers, and likewise the best defensive positions to hold the back doors from people trying to blow them. The maps are the most often sought after of the Primer and can be found immediately after the main pages for those who don't have the time or need to read the other articles. Well this is it. The final update, albeit only this header, to the primer. She’s about to turn 2 years old now and a lot of the information contained is still very relevant to the game. I’m proud that so many people came here to check out tactics and ways to keep squads together. The final upgrade includes Kapitan Turtle's movie that I wrote but was unable to complete. He did a fine job turning the twisted images in my head to a realized final product. You can download it here, you will need Divx cos the Turtle only does Divx. Primer is still being updated by the current outfit Officers. We will be here to change things as the game evolves. Be sure to view the last page in this Primer, it contains most of the names of the people who helped provide information to help make it. There are countless numbers more though, who have come and gone over the years (yes years at this point) whose names elude me. We made this Primer for ourselves in the beginning, but by the time it was done, it was available to everyone to help squads organize. We liked to think that THIS was the way the game should have been played from the get go. No matter WHAT you think of WNx you KNOW that when we worked in the field, we worked together, in close proximity, to get the job done. No single WNxer was greater than the whole, all good players, but no supermen. We proved you could use tactics and teamwork to match a seemingly greater enemy, in numbers, and abilities. I think it was a success. Building this guide has been half the game for me. Putting it to use the other. It’s my hope that SOE continues with upgrades to the game and looks at successful games around it to borrow their winning methods to help the greater good. I often spoke to my Planetside crew about how great my Ghost Recon gaming experience was, well, truth be told, it was nowhere near what Planetside evolved to. This was the greatest team of people I ever had the privilege to work with and for and I thank them now for it page one, right here. Finding other people that wanted to play the game, tactically, the way I dearly wanted to, was a dream. Thank you everyone who’ve visited the Primer over the years, it will remain up as a tool for all to use, I hope you enjoyed it.